No, I haven’t dropped off the face of the earth. At least, not entirely. I was at a leadership retreat for work, and our location did not have internet. It really made me stop and think about how “connected” everyone has to be. Gone are the days of the home phone, and I’d be surprised to find that kids in elementary and junior high school even know how to properly address a handwritten letter anymore. It makes me kind of sad. At every single break, at least a handful of my colleagues would rush from the room exclaiming, “I need to check my phone!” It made me wonder…what could possibly be so important that you can’t let it go for four days? I grew up in a home without cable television. My sisters and I spent our free time reading books or playing outdoors, with each other and our imaginations to keep us company. I don’t have an iPhone…as a matter of fact, I still have a pay-as-you-go flip phone that still uses T9 texting. I don’t have an iPad or a tablet or a blackberry. Call me old fashioned, but I like it that way. Let’s talk about tonight’s dinner. I have to say, I’ve been hurting for good food since the retreat. 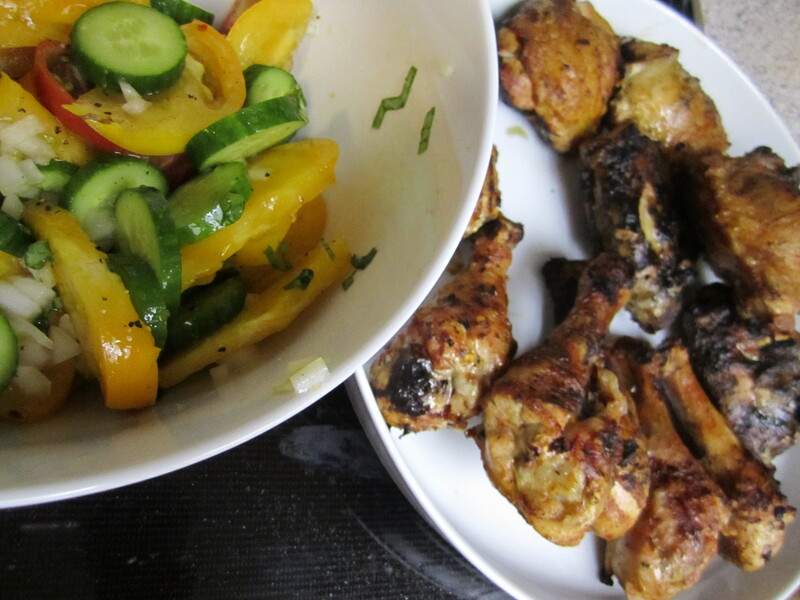 We had all meals provided, and it was HARD to stick to a paleo based diet, let alone a Whole 30 approved diet. But I did the best I could – despite a constant barrage of donuts, homemade cookies, and a never-ending basket of candy that sat on my desk for the. entire. week. 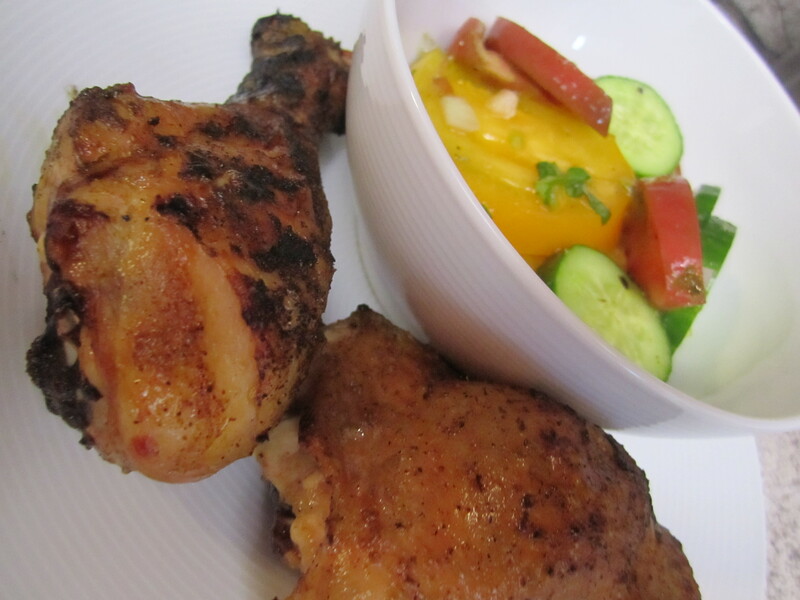 I was craving simple, and the Significant Other had a “picnic pack” of chicken in his freezer. 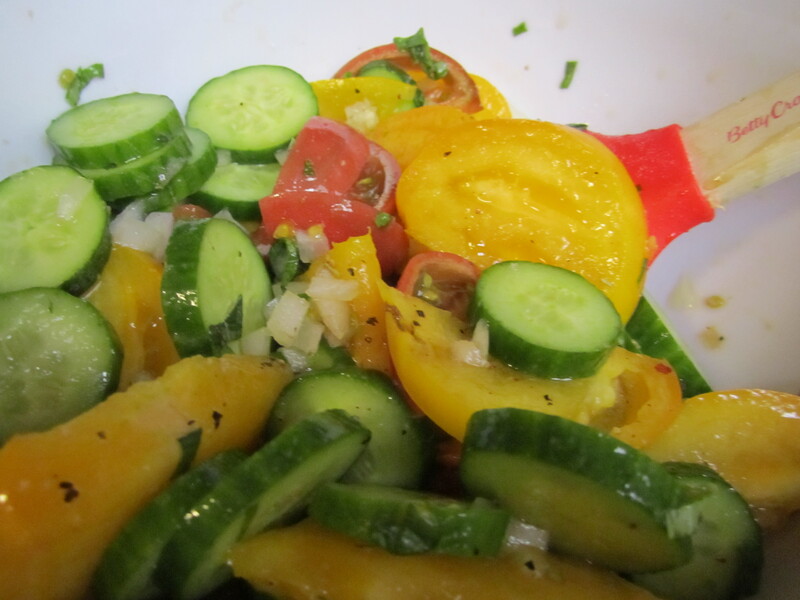 For our side, we made a quick and easy heirloom tomato salad. 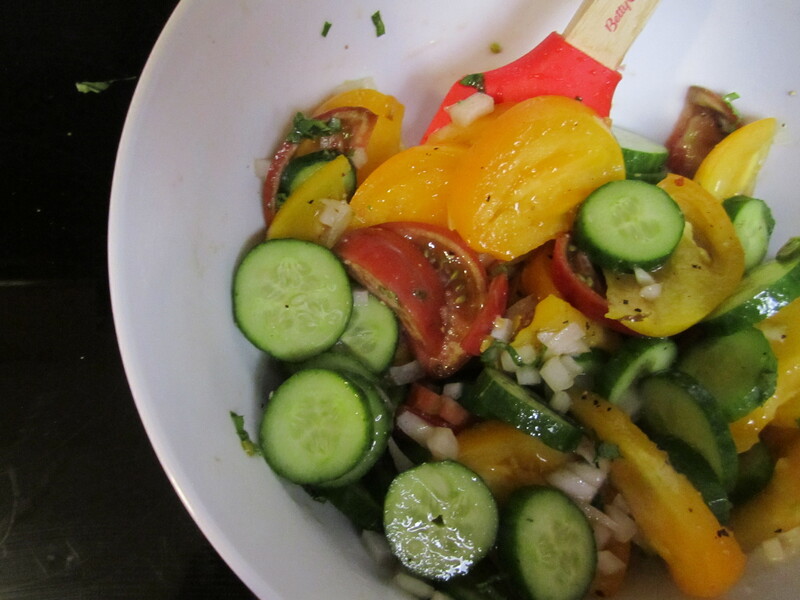 Toss together heirloom tomatoes (LOVE), persian cucumber slices, some chopped onion (red works best, but all we had was white), salt, pepper, and some balsamic vinegar and you’re done! 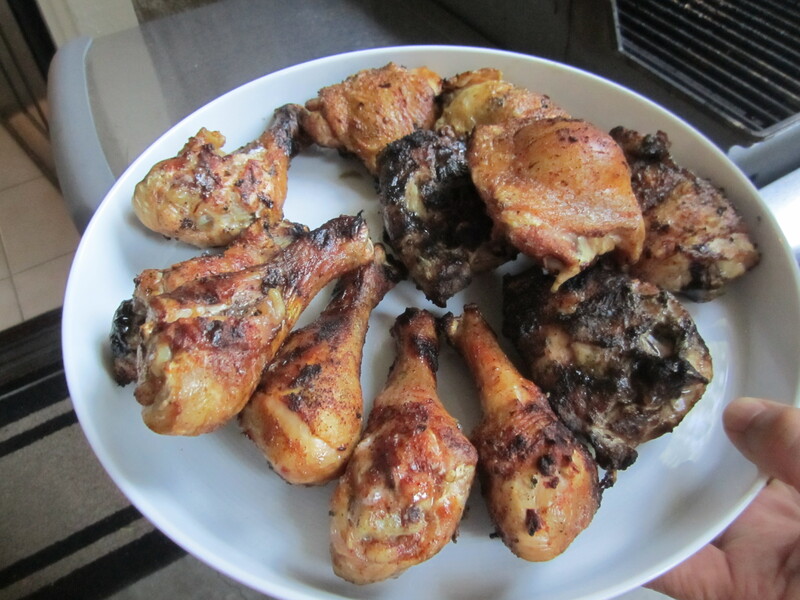 Posted on 19 April 2013 17 May 2013 by BeePosted in Chicken, MusingsTagged Chicken, main course, Whole 30. 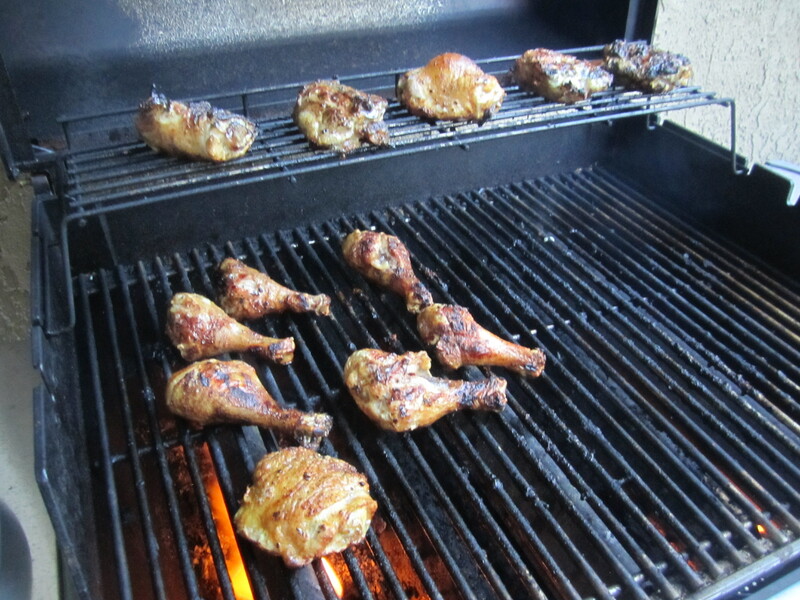 Next Next post: Cooking – California Style!